Agapanthus translates as ‘the flower of love’, from the Greek ‘agap’ (love) and ‘anthos’ (flower), and bees love the flowers too. The flowers are typically blue or purple, though there are popular white and less common grey and pink varieties. With a striking sub-tropical appearance, long flowering period and an ability to thrive in sunny positions in the garden or in patio pots, Agapanthus is an increasingly popular choice for gardeners who have the effects of climate change in mind. There is a wide range of evergreen and deciduous species, varieties and hybrids available for the garden, and careful selection is necessary to match your location and planting conditions. This article provides the gardener with advice on the best ways to grow and care for this South African beauty in all of its guises. 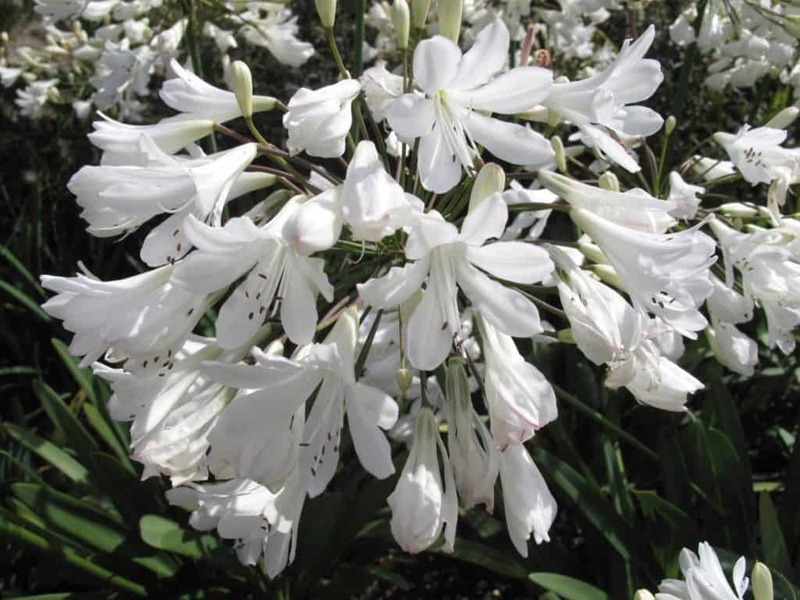 The genus includes some ten species, including Agapanthus africanus and A. campanulatus, from which a large number of hybrids and cultivars have been developed for garden use. 50cm to 150cm, depending on variety and planting position. Sun loving, ideally in a south- or west-facing planting position. There are varieties that are suitable for all but the most extreme temperate zone conditions. Established clumps of the hardiest deciduous Agapanthus can withstand -10ºC to -15ºC in well-drained soil. Deciduous Agapanthus are fully hardy and can be left out in pots and borders, though it is worth applying a winter mulch for protection against the coldest temperatures. Evergreen varieties are not fully hardy, and are best grown in pots that can be brought indoors to a frost-free environment in winter. Need good drainage, so plant in sandy or other well-drained soils, or add grit to the soil when planting. Add plenty of grit to composts for pots and containers. Use a high potash, low nitrogen fertiliser every two to three weeks from March until September to encourage flowering. By division, or, if you are patient, seed. Healthy plants are generally pest-free, though recent years have seen increasing outbreaks of the Agapanthus gall midge. Easy to grow and care for, but getting the plant to flower consistently is moderately difficult. The plethora of varieties available for gardeners derives from a handful of species that are found in South Africa. Agapanthus campanulatus and its subspecies patens are from the cooler climate east of the Cape and the Drakensburg Mountains in north-eastern South Africa. They have pale to mid-blue flowers. These species are deciduous, and have been used to produce hardy and versatile garden plants. The species from the warmer climate of the western Cape are part of the amazing diversity that forms the ‘fynbos’ shrubland that grows on sandy, well drained and fairly acidic soils. They keep their foliage in winter, and are generally not as hardy as the deciduous species. 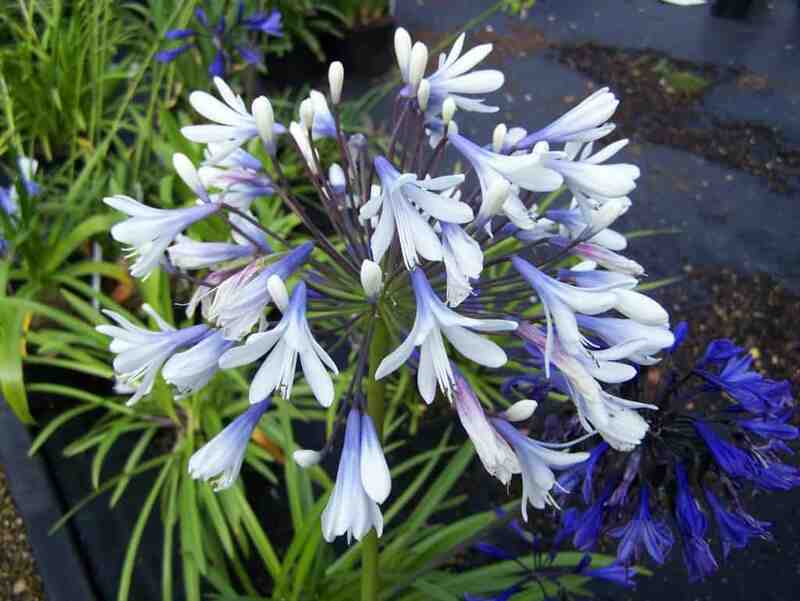 Agapanthus africanus has deep blue flowers, and is widely distributed from sea level at the southern Cape to a kilometre up the Langeberg Mountains, while the closely related Agapanthus africanus walshii grows more locally in the Palmiet valley. 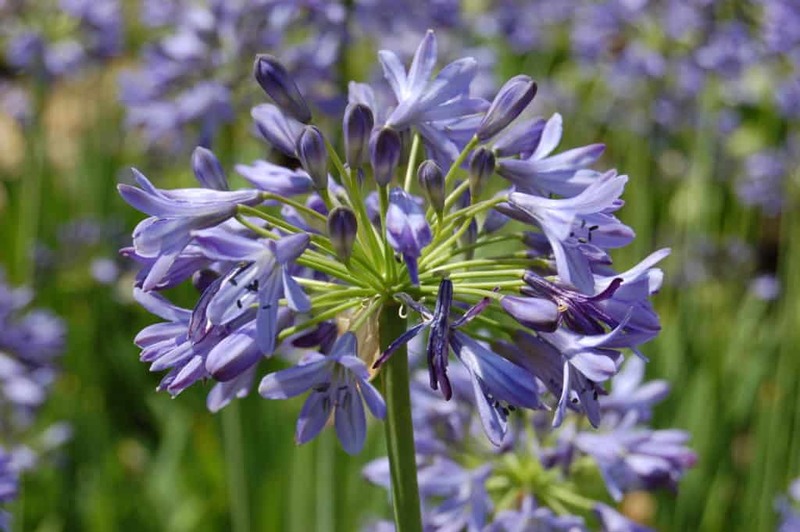 Fortunately, species Agapanthus are now rarely collected from the wild for cultivation, as there are so many readily available and more reliable varieties for the garden. Fully hardy cultivars derived from the deciduous species are recommended for year-round outdoor plantings. ‘Midnight Star’ and the dwarf ‘Lilliput’ are ideal amongst the blue varieties, and ‘Arctic Star’ is perhaps the best hardy white variety. In the early years of popularity, ‘Headbourne Hybrids’ was the most widely grown deciduous variety, with its reliable displays of lilac flowers from July through August. With the introduction of new cultivars and extensive independent horticultural trials, ‘Headbourne’ has been joined in the popularity league by other hardy varieties such as ‘Brilliant Blue’, ‘Midnight Dream’ (with dark purple flowers), ‘Margaret’ (a floriferous powder-blue variety) and, more recently, ‘Twister’, with its bicolour white and blue flowers. ‘Northern Star’ also performs well, even as a young plant, freely producing its attractive mid-blue flowers with their prominent dark violet stripe. The modern, compact varieties ‘Bluestorm’ and ‘Whitestorm’ are now increasingly available, and with a flowering period of up to 70 days, each mature plant producing as many as a hundred spikes of unusually large flowers, and some repeat flowering possible through a mild autumn and early winter, their popularity is understandable. More unusual hardy varieties include ‘Midnight Dream’, with its very dark purple, almost black flowers. For colder, less sheltered gardens, or for growing the more tender evergreen Agapanthus africanus cultivars anywhere other than in the mildest, generally frost-free areas, the plants can be grown in pots that can be moved indoors for the winter. Good blue-flowered varieties for summer-only outdoor pots include ‘Purple Delight’, ‘Lapis Luzuli’ and the late-flowering ‘Hole Park Blue’. Specialist suppliers offer greater variety, and it’s worth looking out for ‘Hoyland Chelsea Blue’ and ‘Tornado’. To add variety and interest to the container, consider the ‘Little Dutch White’, or the similarly petite ‘Silver Baby’, with its unusual white flowers flushed with blue, the dwarf ‘Gold Strike’ or ‘Golden Drop’ with their golden variegated foliage, and the ‘Windsor Grey’, which offers subtle displays of greyish-white flowers. Continuing the royal theme, ‘Queen Mum’ is another of the new white and blue bicolour varieties. The deciduous Agapanthus range from fully hardy to half hardy, and the evergreen varieties are generally the most tender. In all but the warmest winter locations, even the deciduous plants are best protected with a dry mulch of straw as an insurance overwinter. The tender evergreen varieties can usually be adequately protected through the winter in warmer climes with a couple of layers of fleece or a deep layer of mulch applied around the plants in autumn and removed in spring once the danger of frost has past. In colder areas, tender evergreen types should be grown in pots that can be moved to a frost-free cold frame or unheated greenhouse for the winter. Avoid wintering pots in a warm place, as this can restrict flowering in the following summer. Pots and containers are also useful for growing Agapanthus in gardens with soil that is prone to winter waterlogging, as the plant requires good drainage. Single plants can be grown in 20cm to 25cm diameter pots filled with a mix of two parts good-quality, multipurpose compost (such as John Innes No 2 or No 3) with one part horticultural grit, coarse washed sand, or washed gravel. Alternatively, three young plants can be established together in a 50cm pot. Agapanthus flowers better when partially root-constrained, so they should be kept in the same pot for at least two to three years before potting them on to an only slightly bigger pot. Individual plants generally perform best in pots that are no more than 30cm in diameter. Plants in pots or smaller containers will seldom achieve their full potential size because of the ‘bonsai effect’, and while plants grown in garden borders may take more seasons to achieve reliable flowering, when they get there, the flowers do seem to be that little bit more spectacular. Having said that, there are a number of modern dwarf varieties that are excellent for container use, and which flower impressively and reliably. Agapanthus in the garden border also need good drainage, and do best in fertile, well drained, but moisture-retentive soil. Some of the varieties can be grown in slightly less well-drained soil, as long as plenty of grit is added when planting. They adapt to soils of all moderate pH values, except for the species Agapanthus africanus, which prefers an acid soil. Both garden and pot-grown plants thrive best in the full sun, with eight to ten hours of summer sunshine a day, though they will tolerate a few hours of partial shade during the heat of the warmest days. Pot-grown plants must be watered frequently and well through the spring and summer, though they must not be left to stand in the water. They do not need any watering between November and March when they are in their winter quarters. Garden-grown plants will also benefit from frequent watering in spring and summer as necessary to top up any shortfall in natural rain. Agapanthus responds well to regular feeds, especially those grown in containers, but the use of nitrogen-based fertiliser should be avoided in favour of high potash, balanced liquid blends, which will encourage flowering. Specific Agapanthus feeds are available from specialist growers and suppliers. Start feeding in late March and continue every two to three weeks until mid-September. For tidiness, dead or damaged leaves can be cut off at their base at any time of the year with a clean blade or shears. Evergreen varieties should not be pruned, but for annual maintenance, deciduous varieties can be cut back to within 10cm of the ground once flowering has finished and the foliage starts to die back in the autumn. To keep a spreading Agapanthus within limits, or to provide a source of new plants, large clumps growing in the garden or larger containers can be lifted in spring every four to six years. Whether evergreen or deciduous, the top half of the leaves should be removed in preparation, and care must be taken not to damage the roots when lifting the plant. The clump can be split into two or three pieces using a sharp, sterilised knife or saw, ensuring that each piece retains growing points with leaves and roots. Each piece of rhizome should be replanted in refreshed and well-gritted soil, 5cm below the surface. Autumn division is also possible, but less certain, and more frequent division and disturbance will almost certainly reduce flowering. In addition to dividing rhizomes, species Agapanthus can be propagated by seed, though flowering is unlikely for the first three to four years. The seed pods should be collected in late summer as they start to dry out and turn brown. Keep them in paper or muslin bags in a dry place until they split naturally, and then the seed should be separated from the chaff to be stored in a cool, dry place through the winter. They can be sown the following spring, and should be kept moist at around 15°C until germinated. The seedlings will need to be protected from frost in their first few winters in an unheated greenhouse or cold frame. Named cultivars will not come true to type and plants from seed are unlikely to reward the effort and patience involved. Healthy Agapanthus plants grown in optimum conditions are generally problem-free, though rhizome frost damage is a common issue in cold winters, even for the more hardy types, and less vigorous plants can succumb to viral diseases and pests. Yellow leaf tips can indicate less optimal, waterlogged conditions, while pale leaves or flowers suggest some appropriate supplementary feed is required. Amongst the pests, mealy bug or red spider mite can occasionally be a problem, though winter spraying with an appropriate insecticide or organic preparation is generally effective. A new pest has become apparent since as recently as 2014. The larvae of the Agapanthus gall midge (Enigmadiplosis agapanthi) cause deformation, browning or discoloration of flower buds in June to September, though the foliage remains healthy. The larvae live inside the plant tissue, so control with sprays is unlikely to be effective. The plant health team at the Royal Horticultural Society is studying the midge, and recommends the destruction of infested flower heads, or the whole plant where the infestation is particularly severe. Affected plants in pots and containers should be taken out, their roots and rhizomes thoroughly cleaned, and they should be replanted in fresh compost in different containers to protect them from any pupating or overwintering larvae. The affected container should not be used again for Agapanthus, though other types of plants will be safe. Q I like the look of the African lily and think it would do well in my rock garden. What’s the best time of year to buy and plant it? The rhizomes are generally available to buy year-round from garden centres and online specialist suppliers, and are best planted out in spring when danger of frost has past: they can also be planted in the early autumn. Plant your new rhizomes approximately 5cm below soils level in a sunny spot. Containerised plants are also widely available for the more popular varieties. Q A number of years ago I planted some Agapanthus as part of a new flower bed in an old vegetable plot in a sunny corner of my garden. The clump has spread well, looks lush and healthy, but has never flowered. Where am I going wrong? The soil is probably too rich in nitrogen. In such conditions, the plant grows more roots than foliage, and fails to produce flowers. Add plenty of phosphorus to the soil to balance the nutrients. You could also root prune the plants, and, when doing so, add additional grit or washed sand to the soil. Do not add any nitrogen-based fertiliser or compost. Too much shade, very cold weather, a deficit of water in the summer or autumn, and lack of winter protection are other possible causes. Q The leaves on my new Agapanthus have turned yellow and some of them look dead. Should I dig up the plants to revitalise them, then divide and replant? If this is a deciduous variety, then the leaves naturally turn yellow and die back over winter. Leave well be if it has been otherwise healthy and flowered well. Alternatively, if it is generally performing badly, it could be too congested, and it can be divided in the spring. If it is in a pot, move it to an only slightly bigger home, as Agapanthus perform best in constrained pots and can fail to bloom if the roots are given too much room. If the leaves have turned pale and stripy and the plant flowered poorly, however, then your Agapanthus may have a virus and it should be thrown out or burned. Do not put it on the compost heap. Q Should I cut off the stems of Agapanthus when the blooms have died? I planted them in pots last year and had the first flowers this year. Now that they are finished I am not sure what to do. Yes, dead-head the plants by cutting off the spikes as the last few flowers begin to fade and before they begin to set seed. Always cut through the stem with a clean blade near its base, where it emerges from the plant. Q Can I move my Agapanthus, and if so, what is the best time of year to do it? Experts often suggest that Agapanthus flower more freely when crowded in a bed or when slightly pot-bound, so moving plants does risk introducing them to conditions where they will focus on root growth rather than flower production for a few years. However, they can also benefit from being divided every four years, so moving is possible for an established plant, provided it is not done too frequently. In spring, cut the foliage back by half, then carefully dig up the plant, divide if you wish, and replant. Q My neighbour says that Agapanthus is very poisonous and is worried about my dog being affected – I really enjoy the plants that I put out in pots onto my patio each summer. Need I be worried? There is no evidence that pets will selectively eat Agapanthus and many gardeners happily keep their dogs and Agapanthus side by side. Nevertheless, the sap from the leaves and the roots is poisonous, and can cause a skin rash, irritation of the eyes, or pain in the mouth if eaten. In general, the toxicity is considered to be relatively low, and ingestion may cause minor illnesses such as vomiting or diarrhoea. If your pets do eat any, consult your vet as soon as possible. Q I watched a TV programme that suggested that Agapanthus will not flower unless they have become pot-bound. I have some young plants and would like to get them to flower as soon as possible. Should I squeeze them into a pot that looks too small for them? 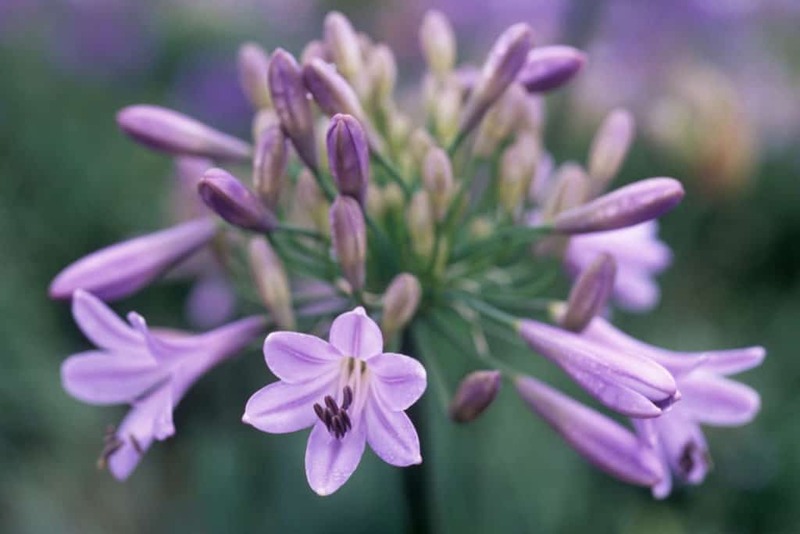 There is a widespread misconception that Agapanthus only flower when it is tightly pot-bound. While they can indeed flower poorly when kept in over-sized pots or when they are divided too frequently, they are also likely to flower poorly when excessively pot-bound. If the rhizome gets too tightly constrained, it is also likely to break a terracotta pot. A good tip is to grow the fleshy rhizomes of Agapanthus in a pot that is much wider at the top than the base, so that it can easily be teased out of the pot when the time does come to pot it on. Q I live near the coast and my garden sometimes suffers from strong, salty winds. Can I grow Agapanthus? Yes, indeed you can! Agapanthus do well in coastal gardens, and are tolerant of salty winds. Many local councils in warm, coastal areas now commonly use them in planting schemes in parks and gardens by the sea. Q I am designing a mixed border about 30m long and 5m deep, and want to use Agapanthus as a central feature because I love its architectural qualities. What do you think would look good with it? Agapanthus is a versatile plant for the garden designer, and it can be used very effectively in a number of ways. As well as being used for accent or as a specimen plant in a small garden or patios pots, the flowers make a wonderful display in mass plantings, and can be a valuable part of more traditional mixed flower borders. In mixed situations, Agapanthus’ structure and architectural qualities work particularly well against grasses such as Molinia, and alongside other lilies such as the day and canna lilies, and especially the pink autumn flowers of the Bowden lily, and red hot pokers. Agapanthus can also be used to punctuate beds of more feathery and refined plants such as penstemons, Russian sage and fennel, and they will contrast and complement other architectural plants such as sea hollies. White varieties of Agapanthus can be used to provide shape and texture in a white garden, and they look very elegant when planted with silvery-grey leaved plants such as silver ragwort. Remember that each plant of Agapanthus will spread to fill an area of up to 60cm, and should grow up to 150cm in height. You can base your design around small clumps of Agapanthus that are spaced through the border to provide repetition and to give the bed pattern and cohesion. For small clumps, plant the rhizomes 5cm deep and space them 60cm apart.